Private pool. Walk to restaurant. 'Pick your own'. WIFI! Mountain views. Hire your own country estate! Full privacy! Well restored character farmhouses all let together, and set in the hills of the totally unspoilt, green & mountainous region of Northern Tuscany. The views from the houses and the pool are beautiful, & the extensive grounds are the perfect place to relax. Ideal for a large group wishing to holiday together but also requiring privacy from each other. All properties included in price. Each property has a private outside eating space/terrace/BBQ & you may pick produce from the grounds, for your al fresco meals! There are two houses, one detached with 3 bedrooms, and one split into 2 apartments with 2 bedrooms each. The Stables - detached house with 3 bedrooms and 2 bathrooms, large open plan living/kitchen diner leading to large private terrace overlooking gardens and pool. Sleeps 6 plus 2. Cecilia- apartment with 2 bedrooms and 1 bathroom, living/diner and kitchen and private terrace tucked behind the house in a pretty courtyard area, and also with a further covered terrace for al fresco dining under the vines! Sleeps 4 plus 2. Formicola - apartment with 2 bedrooms and 1 bathroom, living/diner and kitchen and large terrace overlooking the mountains. Sleeps 4 plus 2. Each property is full of character and there are beamed ceilings, chestnut windows, traditional flooring, yet they are well equipped with modern kitchens and pristine shower rooms. Enormous private site, with no less than 4 eating terraces, 4 large BBQ's for al fresco dining, allotment with extensive 'pick your own' produce, large private pool with plenty of sunbeds and a shaded gazebo area too... Plenty of room to be together and separate too! This is a real away from it all retreat, yet only 5 min. by car to a large village with supermarkets, bars, restaurants & train station serving Lucca, Barga, Pisa, Florence & The Cinque Terre AND only 500M from a fantastic restaurant - an easy and relaxing walk away! The bread man visits daily too. The views from this extremely peaceful site are magnificent - the houses overlook the green and fertile Serchio valley, with views of the Apuane and Appenine Alps. This really is the perfect location - an ideal place to unwind deep in the countryside, yet close enough to all local amenities, and a convenient base for exploring by car or train. 12M x 6M . 1.5M deep. Open 1 May to 1 October ask outside of that time. Swimming pool is 12M x 6M. Cot & high-chair available on request. Daily cleaning available at extra cost. We can arrange for someone to come and cook the odd meal for guests - a lovely evening! Very comfortable property, we had the 4 flats for 21 persons. The owner is very kind and it is so great to have some fresh fruits, tomatoes, cucumbers and potatoes directly from the garden! Pool is huge, a bit cool but that' OK. The garden and outdoors amenities are great with an amazing view on the mountains. Very quiet and peaceful. Only one dishwasher for the entire property, would appreciate to get one more... But really, we had a very pleasant stay at La Sambuca ! Glad to hear you enjoyed the property! Your comments have been passed onto the owners. We enjoyed our holiday at Sambuca. Beautiful quiet area. Our hostess Oriana is very friendly and brought us fresh vegetables from her garden. The children loved the big swimming pool. We visited Lucca and Pisa. Thank you for your review. We are happy to hear you enjoyed this beautiful place and those views! Oriana would be pleased to welcome you again. We had a good time here with 20 people for a week. The area and the houses did meet all our expectations. Good playing area for kids and nice environment. This can be highly recommended. Good to hear you had a lovely time and that everything met your expectations, and you would highly recommend to others. The place is fabulous. Couldn't have asked for better for our big party. Fantastic setting, beautiful property. Pool was great. Only slight downside is that it is a bit remote for food shopping etc but I guess that is a small price to pay for such beauty. Sad to leave at the end of our week. Thank you for your review. We are glad your family celebration was a success and that you enjoyed this beautiful place! The lady that cooks meals for guests on request is absolutely brilliant and good value too for a special evening - we have also done this when staying at the property and it was a wonderful evening. We rented the whole propertity (both houses) for two weeks and it was a wonderful holiday. Very quiet surroundings, spectacular view at the mountains, very, very nice and generous hosts (your vegetables and fruit were just delicious!). Lots of things to do in the vicinity, but take your time for the small and winding streets. Go hiking or climbing, it's awesome! Thank you for your review. We are glad you enjoyed your stay here, in particular those views, and the countryside! As you say it is great also to eat produce straight from the allotment. We hope to see you again some time. 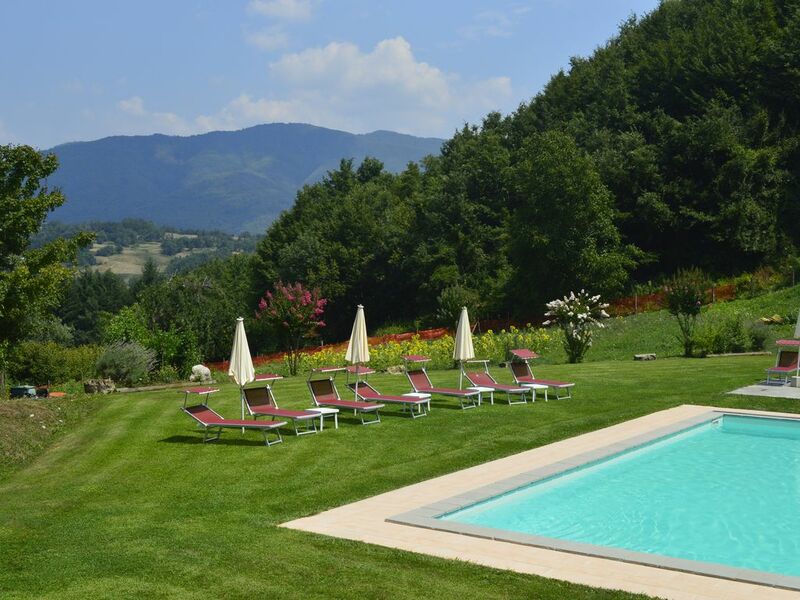 Situated in the unspoilt mountainous Garfagnana region of N Tuscany, less than 1 hour drive North of Lucca, and 1.5 hr. from Pisa/2 hr. from Genoa. Located 25 minutes North of the market town of Castelnuovo, this is a collection of 3 houses nestling in the midst of hills. The grounds are extensive, and parts of the gardens are used for growing local produce, which guests are welcome to use. Less than a 5 min drive away there is a village with restaurants, supermarket, Tuesday morning market, and Train Station and bread is delivered each morning. One can also walk to a restaurant in less than 10 mins - home cooked local food! You need to book.